Sometimes, I find it really hard to read a companion novel when you've not read the book that started it all. 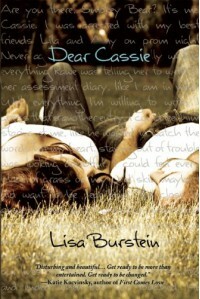 This was the case with Dear Cassie, Lisa Burnstein's follow up to the popular Pretty Amy that debuted last year. Pretty Amy is a book I've wanted to get my hands on for a while, but I have no idea why I haven't read it. Needless to say, when the opportunity came around this time to read Dear Cassie, I was completely taken in by the sypnosis, and knew that no matter what, this would be one book I'd definitely be reading, blog tour or not.Before I begin though, I have to warn you that Dear Cassie deals with some very heavy stuff, and as such, I'd only recommend it for mature YA audiences only.Dear Cassie is pretty heavy, and I'm not sure exactly where to begin or where my feelings exactly lie with this book. I have to appreciate the wonderful job that Burstein did in creating such a raw and emotional book that really hits you hard. Cassie's been sent to a rehab clinic, but it's not your usual white-walled, let's talk about our feelings place. It's in the middle of the wilderness in nowhere, for starters. Told in diary format, we learn Cassie's side of things and her emotions from the after prom, which is where I'm guessing Amy's tale begins in Pretty Amy. What I loved about this book was how honest everything was. Burstein doesn't sugarcoat her characters, and it gives this startingly raw edge to the book that makes you really sit down and read all the way through in one sitting. Cassie's so emotionally driven by guilt, that it's hard not to feel for her, and understand why she has begun - and continues to - push everyone away. Her honesty and frankness was something I've never really read before in a main character, and it really really touches you. I mean, how often do you find someone like that in real life?Another thing I loved is how Ben, who you can consider as the main character's 'love interest' of sorts, never really gives up on Cassie. Despite having his own problems, he never once doubts Cassie as a person, even after finding out all her secrets. And by God he cracked me up, especially at the end. If it's one thing you read this book for, it's the ending chapters, because there is one hell of a romantic gesture that Ben does that really swept me off my feet.Unfortunately, there were some areas that did fall flat for me. Maybe it was because I haven't read Pretty Amy yet, but there were parts of the story that I felt were unexplained, or alluded to as if the reader was expected to know what had already happened. I also felt as if there could have been a better balance to the story that was taking place, as well as Cassie's diary entries where we got glimpses of what happened. Overall, I both enjoyed and kind of didn't enjoy this book. 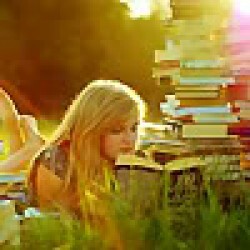 While I thought that the ending (apart from one, epic scene you'll just have to read the book to find out!) kind of lagged a bit, the more I think about it, the more I kind of think that that was Burstein's point. Happy, or at least, rounded endings don't happen in real life, and it's good to see that transferred on to the page as well.Definitely one for those who love more than a light contemporary, Dear Cassie was a highly thought provoking book that deals with many issues I'm sure teenage girls face on a day to day basis, especially in the world we currently live in. Give it a read yourself, and I'm sure, like me, you'll be pleasantly surprised.